His Excellency Prime Minister Dr. Haider Al-Abadi has confirmed on adhering to the great achievement achieved by the Iraqis in winning against Daesh. His Excellency has pointed out that the sacrifices should not be forgotten, warning of those who wanted to instill fear among the fighters and spread rumors. But they did fail, and today they are eager to encourage terrorism. This came during His Excellency speech of in the celebration of the great victory held by the Joint Operations Command, where His Excellency has hailed the families of the martyrs and the wounded, which victories were achieved by their sacrifices, as well as all the fighters and all those who played their part in defending the homeland. 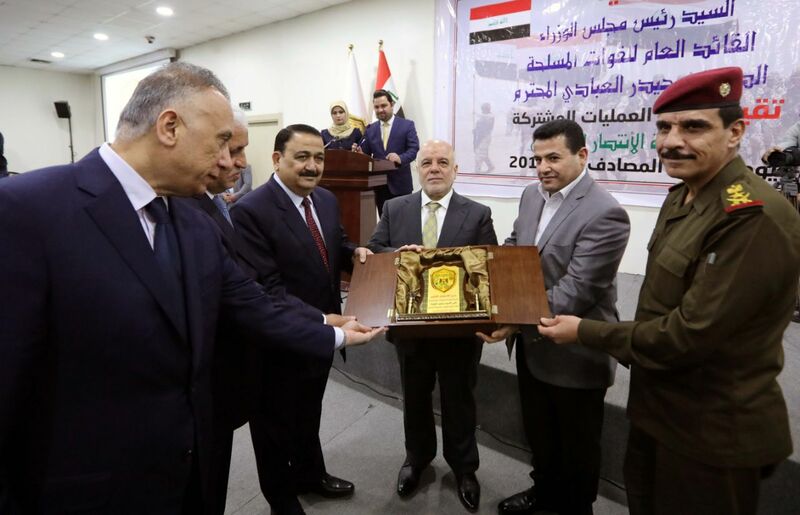 Dr. Haider Al-Abadi has said that there are many challenges we have faced, including unity to achieve victory and we succeeded in this and fight corruption within the military institution, where corruption harmed the body of the previous security forces, which is the basis of evil, Pointing out that we have exceeded all these things and achieved victory, confirming that in every victory story there are victorious and there are disobeys. Dr. Haider Al-Abadi has pointed to the fatwa of Grand Sayyad Al-Sistani, which led to the great rush and victory. His Excellency has also asserted that the next stage is for building and reconstruction, pointing out that as we have won over terrorism, we will succeed in reconstruction and construction.